The Elder Scrolls Online will present the Imperial City as Endgame region in which even experienced heroes and adventures come at their expense. We have the capital of the Empire in Bethesda MMORPG considered closer and draw up a practical guide for you! In The Elder Scrolls Online, the imperial city is occupied by the Daedra and their henchmen Mannimarco capital of the Empire. But due to the Daedric invasion, a shadow of itself and instead joyful city bustle and sumptuous Arena games reigns pure horror in the once beautiful city. Therefore, the imperial city is only recommended for experienced and hardened heroes. The Imperial City is a prime example of urban planning and architecture, because its structure is just circular and all districts and neighborhoods are laid out according to a precise plan. 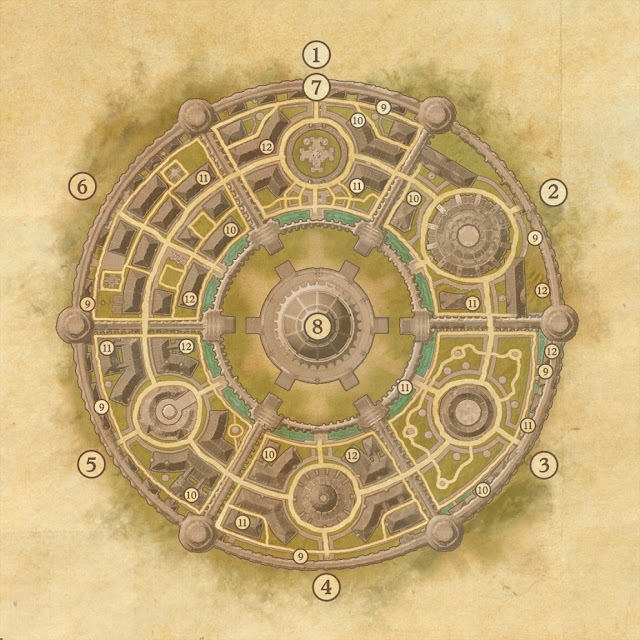 Six districts are grouped as a ring around a picturesque moat, behind which stands in the center of the famous White Gold Tower, the former residence of the emperor before the Necromancer Mannimarco nesting for there. The individual districts and regions of the imperial city you see on the map. The numbers stand for the municipalities, dungeon instances and airports of the individual fractions. Once the Arena District was the cultural center of the imperial city, in the spectacular fights and performances could be admired. Now, however, the sinister Daedra have spoiled the magnificent structure that competes for their fun regular innocent residents against beasts. For brave heroes there are the trophy chamber of Dark Aether and the arena in which you can create yourself with the beasts of the Daedra. In Arboretum District feel the same desolate, because this once beautiful garden where once strolled scholars and disputed, is now roam from Lady Malygda – a Spider Daedra. Whoever you meet, must be prepared for a tough fight. As a hero you can get the trophy chamber of claws plunder and organize valuable equipment in the armory of the arboretum. The Fairy Garden District was once a very nice and beautiful residential area, but have opened since the traitors from the so-called Legion Zero camp here, the pretty residential area is like now more a battlefield. Here you will also find the trophy chamber of ebony armor and Zoal, the leader of the guards Always. Once the Memorial District was a big market district, but since Varen Aquilarios came to the power, he turned the district into a sort of cemetery and memorial place to the many fallen soldiers to remember on his way to power. Unfortunately, now the Necromancer cult of worm have spread here and desecrate the graves of their unholy rites. In the memorial area is home to the entrance to the prison, as well as the trophy chamber of bone shard and the armory of the memorial district. The nobility district was once the abode of the upstanding citizens of the imperial city and the place last resistance, as the Imperial Captain Caudex here for months defied the Daedra. Here you find the armory of Adel district and trophy Chamber of Legion seal. But pay attention to the twilight horror Baron Thrisk who goes in search of victims! The temple area is also a corrupt place where the once magnificent temple was spoiled by the blasphemous Daedra and transformed into a giant torture chamber. There torment and sacrifice the Daedra priests to maintain their dark god Molag Bal. In the temple's district are still the trophy chamber of monster tooth. The prison is located in the Imperial City Memorial District and was taken over by the Daedra, after the prisoners had made there only for utter chaos. Meanwhile, there reign a cruel twilight terror and if you explore the prison, you will encounter ancient ruins under the complex. The White Gold Tower, the landmark of the city and of the whole Empire, is a particularly challenging dungeon instance in which you will find one of the legendary writings of the ancients and must bring to Molag Bals thug in security. Both the White Gold Tower and the prisons are designed for four players and can also be done at the VA mode. The latter offers a view of the prey Veteran stage 16th. The whole imperial city is criss-crossed underground by a network of channels in which roams all sorts of horrible beasts. From there you will reach a lot of places in the city, including the White Gold Tower, all the districts, and the bases of the political groups. Regularly there is a special event in the center of the sewer. A safe haven for your Heroes is the bases of the three alliances in the imperial city. There you will find clients, dealers, banks and shops. The Warriors of Aldmeri Dominions can be found in the sewers under the temple and Arboretum District. The fighters of the dagger fall-Alliance , while the brave soldiers of the Ebonheart Pact live below the arena and memorial district.